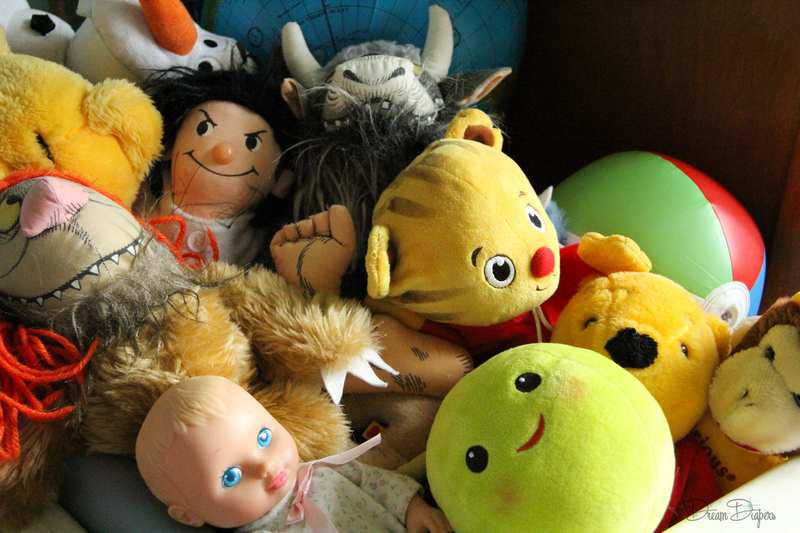 Today, we’re tackling that nightmarish space where all good toys go to die: the playroom. 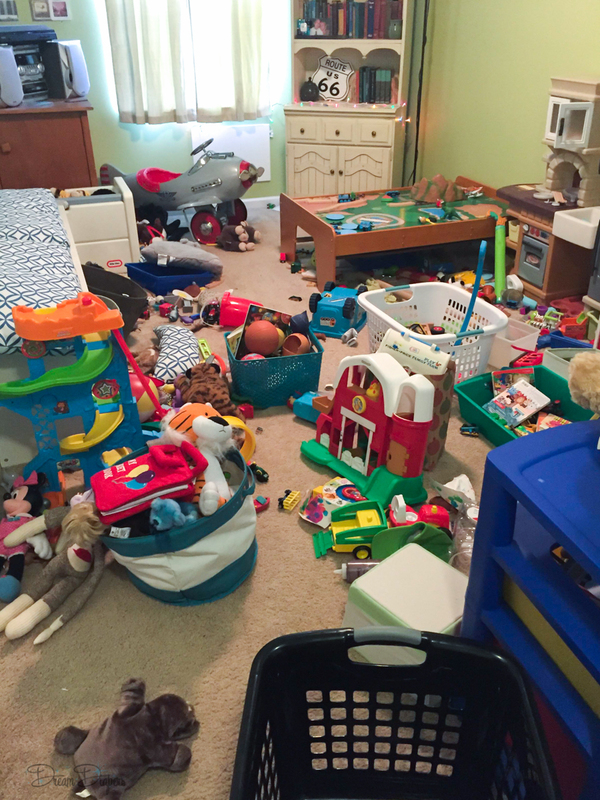 It’s incredible how one tiny person (or several tiny persons) can create a domestic disaster so catastrophic that it makes grown women curl up in a ball and cry just to think of tackling the job of cleaning it up. Because even though mom yelled until she was hoarse about how “You kids need to clean up that playroom!” she always ended up helping us or doing it herself in the end. Here are five easy steps to tackling that beast of a mess that will not only make the job go by faster but will lower the occurrence rate as well. 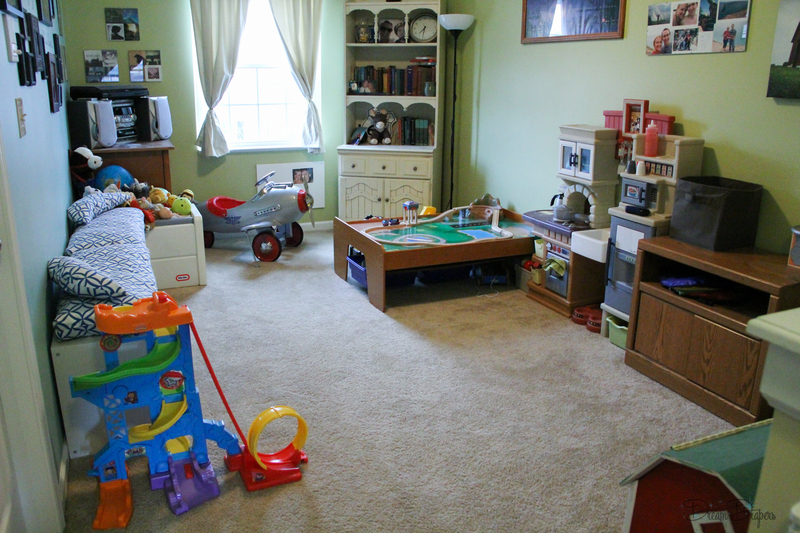 As an added bonus, once the playroom is clean, your child may actually play in there instead of dragging toys all over the rest of the house! Step 1: Collect a few trash bags or laundry baskets or cardboard boxes- whatever floats your boat. You need one for trash, one for donations, and one for long/short term storage. 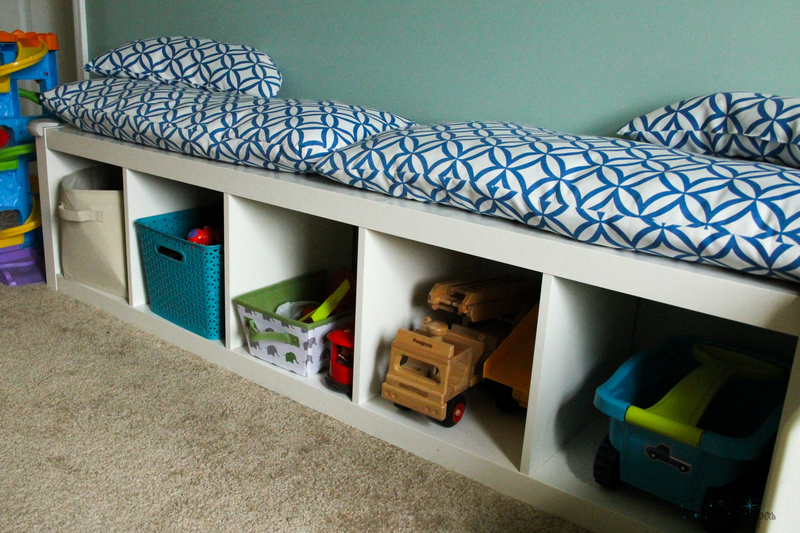 Step 2: If you don’t already have toy storage bins/boxes/bags, buy some or make some using cardboard boxes and pillow cases. 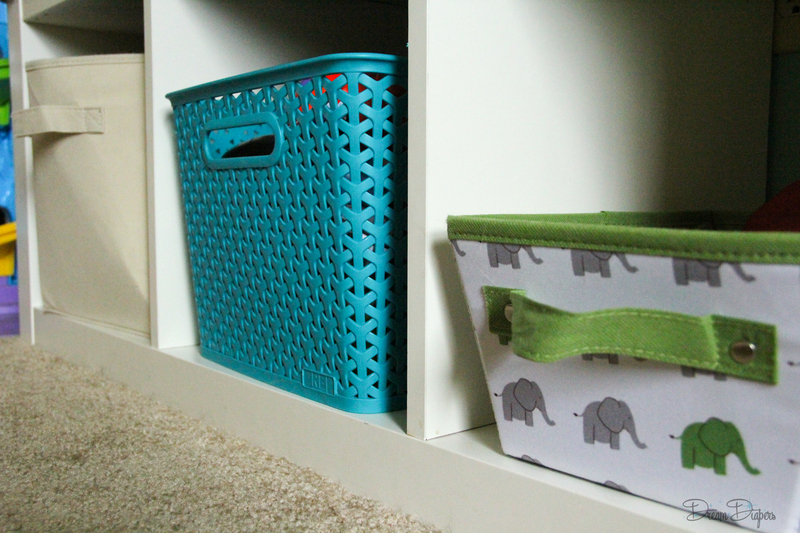 For us, we like our Ikea shelf with the cloth storage cubes, a Steralite three drawer organizer, and a Fisher Price toy chest. If you have an extreme overabundance of toys, you may consider purchasing a few Steralite totes to set some aside for later. Step 3: Sort and decide- toss completely broken toys in the trash, throw toys that haven’t been played with in the last three months in the donation box, and toss ignored toys that are too juvenile or too advanced in the long/short term storage box. 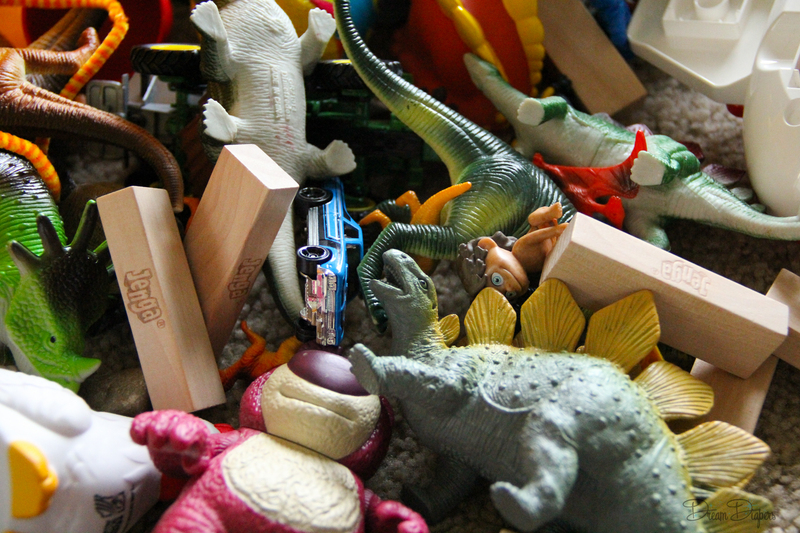 The rest, sort into your chosen toy storage containers. (For example, put all the dinosaurs in one bin, all the Toy Story toys in another, all the stuffed animals and babies in the toy chest, etc.) The hardest part for me in all of this was sorting through the stuffed animals, but we were being OVERRUN as I’m sure you are too. Option Step 3.5: If you still think there’s too much out, grab a Steralite tote and toss in a mixture of the excess toys. Rotate them in and others out once every month or every other month. Hide the bin elsewhere in the meantime. The more junk you can get rid of in their space, the less you or they will have to clean up later. Step 4: Vacuum, toss the trash bag in the can, and throw the box of donations in the back of your van to drop off later to Goodwill, the Salvation Army, the local Women’s and Children’s shelter, or whatever organization near you that you choose. Even simpler, if you have this option in your area, call Purple Heart or Goodwill and schedule for them to pick up your donation. Or if you want a little extra cash, take those items to a local consignment or buy out right shop or post them on garage sale sites online. Step 5: Have a glass of something delicious for a job well done while showing your children how the playroom is now organized, and let them know you expect them to keep it that way (even though they probably won’t). I recently did this with our upstairs loft, which had just become an insanely dangerous fire hazard where Lucas wouldn’t even play because he could never find anything. My mom took him to the indoor play area for the afternoon while I knocked it out. I put a lot up in the closet that was too juvenile for him now and grabbed the items he never played with to donate. I was surprised how taking just a few toys out made the space seem so much bigger. Now that everything has a place (the way it does at school) he will (surprisingly) initiate cleaning up by singing the clean up song and putting things back where they go. He often needs assistance and encouragement or redirection, but he’s 2; that’s expected. I’m just glad to no longer fear for my life when trying to get from one end of the loft to the other. Be sure to pin this post for future use and share with friends! 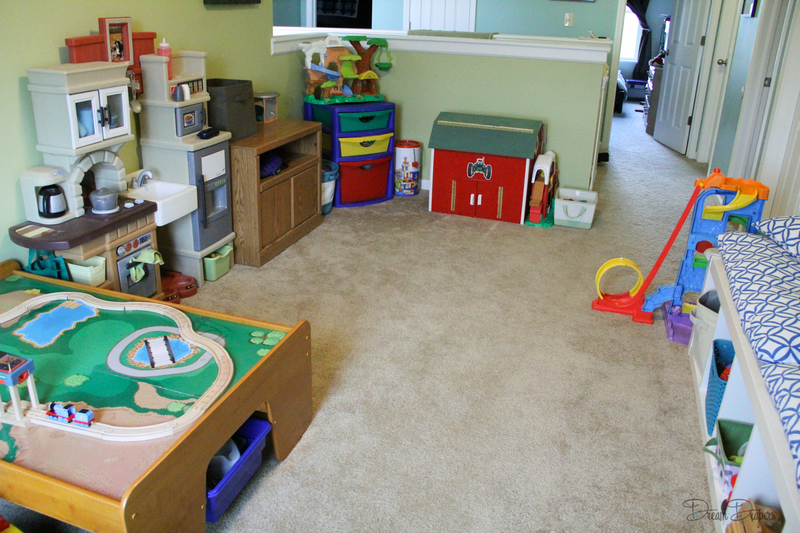 Have any other playroom organization tips? Feel free to share in the comments below!